What is Being a Teacher Really Like? Well . . . what is it really like? These five teachers shared their biggest takeaways from decades in the field. 2014 in suspense. You can learn more about her at her website. 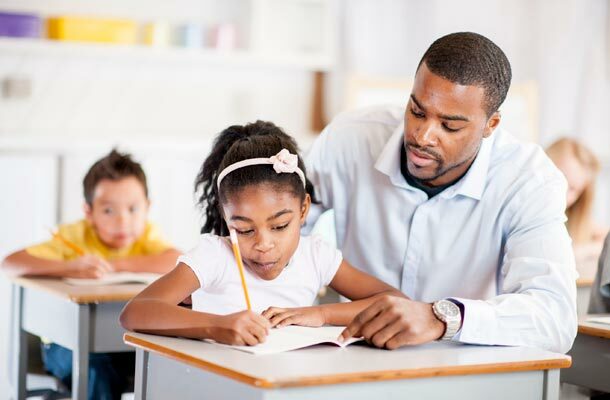 For potential teachers, I always suggest that they have some kind of experience with children or adolescents before they begin education course work. It is important to know that working with kids is something they want to do. For future bilingual or ESL teachers, I would expect and, indeed, encourage future teachers to have a language learning experience themselves in order to be sympathetic and even as vulnerable as the English Language Learners are. I also encourage future teachers to get involved in community education activities so they will be connected and primed for a teaching job when they graduate! It's also a good way to find out the districts' professional development focus, philosophy, and accepted methods. Dr. Holly Hansen-Thomas is a university professor at Texas Woman's University, where she trains future teachers. She was also a public school teacher. Her specialization is English as a Second Language and Bilingual Education. If you’ve ever heard “grown-ups” talking about their work being unfulfilling or boring or lacking purpose, you will never experience that if you become a teacher! Each and every day, you will help more than you hurt, and you will make young lives better. When your head hits the pillow at night, you will rest assured that you have made the world a better place, heart to heart, human to human. Is it risky? Is it hard? Of course. It’s caring for young people. But it is one of the most invigorating and fulfilling things one can do with one’s life. And, to be clear, it is a life, a calling, not a job. If you’re considering the teaching profession, you must already have a sense that you would enjoy helping young people in their development. But how can you know exactly whom to help and how? Research. This is about learning, after all. Visit as many classrooms at as many grade levels in as many environments as possible. Interview the teachers, the students, and the administrators and balance what you learn with where your passions and skills lie. Make a call to your favorite former teacher (or principal) today, and get started. Mike Metzler is a high school and college educator, and the author of Carpe College! Seize Your WHOLE College Experience. He has taught for nearly two decades of high school and college combined. He currently lives and teaches in upstate New York. Teaching means that you have an emotional investment in making our world better, and you use your skills and gifts to achieve that within your own classroom. You see each student as unique, and you realize that his gifts are special and deserve to be developed and celebrated. Teaching is a tough but rewarding career. You earn every penny. My advice to new teachers is to find, deep within yourself, the magnetic aspects of your personality that will help kids connect with you. Not every teacher needs to be Tony Robbins, but they do need qualities that encourage students to trust and believe in them. If you chose to teach because you can talk for days about literature, because you enjoy sharing things you like with other people, and because you tend to be a happy person who can bounce back after failure, then you’re on the right track. I know that new teachers feel anxious and overwhelmed. Having a positive attitude and a proactive mindset will save you from many headaches. This might sound a little sappy, I know. But think about it: Are good teachers the ones who dislike kids? Who find teenagers annoying and dumb? Who are down on civilization? Heck, no. Those people need to get out of the profession, like, right now. Kindness, confidence, strategic thinking, and inner joy are the four factors that turn classrooms into places where kids feel inspired, happy, and confident. Whether they remember minor details about the turtle’s symbolism in Chapter 3 of The Grapes of Wrath doesn’t matter in life. Their confidence and joy for learning matters. I aim to be a dynamic, inspired teacher. Students are drawn to enthusiasm and catch it. They appreciate passion and kindness and genuine interest. Harness those things, and you will have a successful, rewarding career. Meredith O’Neill is an English teacher with 23 years of experience at the high school and junior high levels. She also blogs about fostering creativity in the classroom. A teacher must be dedicated to the notion of change. The essence of education is to reveal the unknown by either breaking a set and looking at something in a new way or building upon previous knowledge and experience to seek greater understanding and truth. In either case the teacher is the instrument of change—defined as learning. Drawing upon a constellation of acquired skills and techniques, the teacher creates the environment for learning to take place. In addition to dedication to change, the teacher must embrace the importance of relationships with his or her students. Without a genuine desire to build relationships, the arc of learning will be severely curtailed. Appreciating differences, respecting the dignity of each student, and accepting responsibility that a student's failure to learn is the responsibility of the teacher are the necessary building blocks of creating a teaching-learning relationships with students. The greatest joy in teaching is to facilitate that “ah-ha!” moment when a student realizes that there is a new truth or understanding that resulted from their interaction with their teacher. people seeking to change careers and become a teacher. You take students from where they are now to where you want them to be. If you are a high school teacher, you should be willing to help students after they graduate. I help students get internships and jobs, and I connect with former students and athletes using LinkedIn. I usually get solicited for help quite frequently. I also created a LinkedIn group for alumni of our high school that has been helpful for these former students. I believe teachers are role-models for children. They should act and behave the way they expect their students to behave. Get to know your students. They will work hard for you—and, really, themselves—if you genuinely care about them and show it. Joseph M. Davis is a Business Teacher at C. Milton Wright High School in Bel Aid, Maryland.